When the existence of Mario + Rabbids: Kingdom Battle was leaked to the world earlier this year, I was hardly the only one scratching my head. But the game launched to great critical reception as one of the weirdest, most interesting Switch exclusives of the year. The XCOM inspired crossover out of Ubisoft Milan was as good as it was thanks to the influence of Nintendo, according to Creative Director for the game, David Soliani. 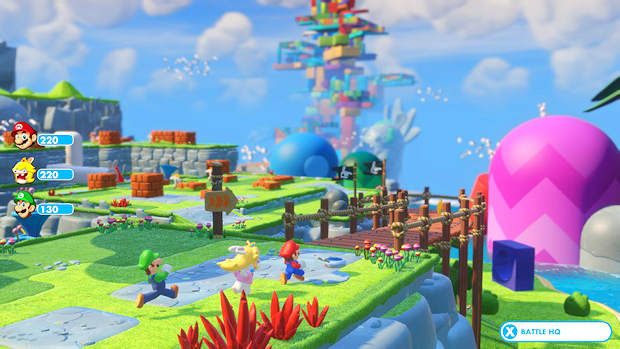 In an interview with Gamesindustry.biz, Soliani recounts how involved and serious Nintendo was about helping the project be all it could be, how they wanted to be involved first hand in the entire project, how their feedback was their safety net, and how the involvement of Shigeru Miyamoto at the reveal helped turn around the reception. “Nintendo were super picky. They wanted to know everything, and play everything. This was good, because it gives you a feeling that you are safe. They have over 125 years of lifetime, and they’re giving you feedback with the expectation of a certain level of quality. So for me, Nintendo is a shield. It means we know we’ll hit a certain level. Having Miyamoto on stage [At E3] was effectively having the father of Mario tell the audience that, if he’s here, then it must be a quality game. Then the players played it. That’s when we started to change the mindset,” says Soliani. Also enraptured by the creative crossover, Gamingbolt gave it a strong 9/10, roughly in line with the Metacritic score of 81. If it’s been awhile since you’ve enjoyed the game, the second DLC pack is currently out to enjoy.